Though its commentary is sometimes weak (or too obvious), Diary of the Dead uses the camcorder-shot footage to great, frightening effect. There’s a real function behind the form, unlike Cloverfield, Quarantine, and other gimmicky “video-taped” films. Romero goes back to the basics of what made Night of the Living Dead and Dawn of the Dead so scary: he focuses on just a couple individuals who are surrounded on all sides by zombies. 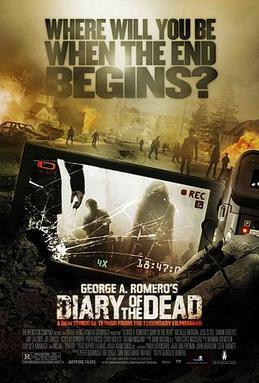 Land of the Dead was an interesting–though ultimately unsuccessful–departure from this style, but Diary of the Dead puts the horror on the individual once again, and it works. Like I said, the commentary is obvious…but the film works as a nice, scary zombie film (something which, judging by all of the horrible zombie films I’ve seen lately, is much harder to pull off than it seems). Survival of the Dead is probably the worst zombie film that George Romero has directed, which is really saying something: when I was in a fraternity as an undergraduate, I used to haze my “little brother” by making him watch Day of the Dead, the atrocious, humorless, mean-spirited gore-fest from the early ’80s about zombies in a military installation. Romero has made six of these zombie movies, and I suppose it’s a testament to his creative ability and imagination that he’s found a way to continue making them new and fresh and interesting over the course of thirty or forty years…Land of the Dead was an ambitious look at a post-apocalyptic world that has developed a new ruling class, and Diary of the Dead was a fantastic Cloverfield-esque approach to zombies, even offering some social commentary on the YouTube Generation…but Survival of the Dead is the first time where I’ve actually thought that Romero was out of ideas. Nothing in this film feels inspired. The special effects are poor. The characters are thin and often resort to repeating the same one-liners over and over again. The sets and settings are badly established and poorly filmed. The script is comically bad. This feels less like a creative effort than it does the fulfillment of a contract. 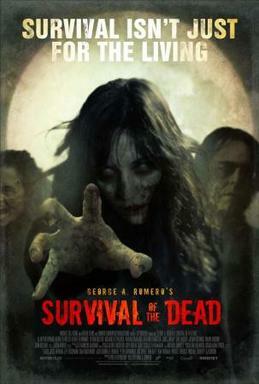 It’s like everyone is just going through the motions, and if you thought that zombies are creatures that are always just going through the motions, then you haven’t seen Survival of the Dead. Even the zombies are boring and lame, here. The greatest failure of the film, though, is that it sort of forgets that it’s a zombie movie, and Romero tries to focus exclusively on the human drama. But he’s not really a great director of “human drama,” and so much of the film just comes across as cheesy. Like a bad USA show. We watch Survival of the Dead because we want zombies, and if Land of the Dead wasn’t quite successful because it was too ambitious for a zombie movie, then Survival of the Dead is an absolute failure because it has zero ambition. After Diary of the Dead (which I really enjoyed), I was looking forward to this movie. Too bad, George Romero. Too bad.